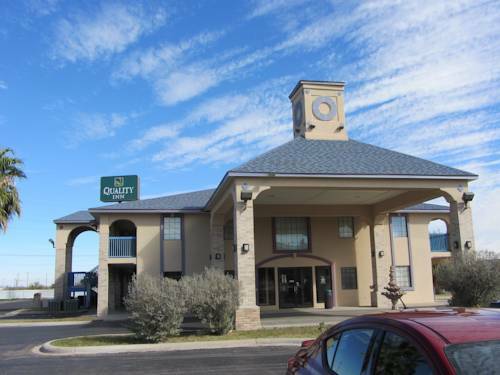 Get more for your money at the Quality Inn and Suites North hotel in Gibsonia, PA. We are conveniently situated right off the Pennsylvania Turnpike (Interstate 76) and State Route 8 near Rivers Casino, Hartwood Acres Park, Heinz Field, CONSOL Energy Center and the Pittsburgh Zoo and PPG Aquarium. You can count on amenities like free WiFi, free breakfast, free coffee and an exercise room. Guest rooms come equipped with TVs, hair dryers, coffee makers, irons and ironing boards, microwaves and refrigerators. We also offer membership to the Choice Privileges Program, which gives members the opportunity to earn valuable rewards points toward airline miles, gift cards and free hotel room nights. Copy machine: .10 per page. Fax machine: 1.00 per page. Pets Allowed $15.00 Per Night Per Pet. A Maximum of 3 Pets per room. ~59 miles from Fort Stockton.